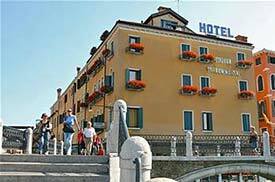 If you're traveling through Venice Marco Polo or Treviso Airport, staying at a hotel near airport buses can be handy--especially when you have an early-morning departure. 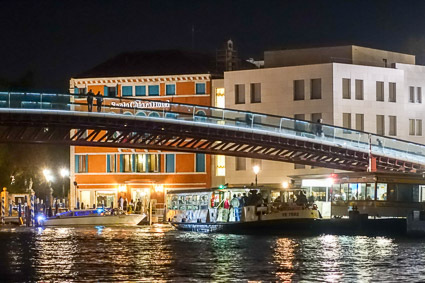 In our detailed article on Venice Airport Hotels, we describe hotels in all price ranges that are convenient to airport ground and water transportation (including Venice Marco Polo Airport buses, Treviso Airport buses, and Alilaguna airport boats). 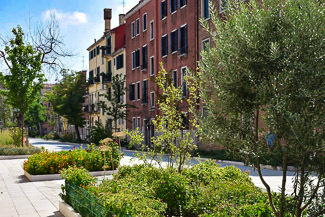 Still, if you're in a hurry, these listings of 10 hand-picked hotels on or near Venice's Piazzale Roma will be handy--especially if you have an early-morning departure. Along with the AC Hotel Venezia, Ca' Doge, or Casanova FourRooms (see below), the four-star Hotel Santa Chiara is one of the most convenient hotels if you have an early-morning flight or if you don't want to haul your bags over bridges. Superior rooms have canal views, while some of the cheaper rooms are at the Residenza Parisi (near the Piazzale Roma vaporetto stop). The AC Hotel Venezia is a mid-priced, European-themed "design hotel' in a contemporary building that fits in beautifully with its surroundings. The hotel's entrance is on the quiet side of the Piazzale Roma, less than a minute on foot from ATVO airport buses and the People Mover to the Marittima cruise terminals and the Tronchetto parking garage. 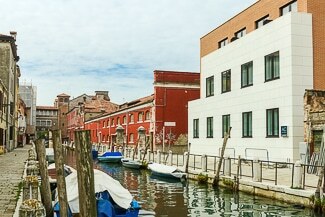 Most of the 79 queen and twin rooms face a quiet pedestrians-only side street or a landscaped courtyard, while 14 "water view" queens at the back of the hotel (large photo above) overlook a traditional Venetian canal. You can see more photos in our illustrated review. Ca' Doge, a six-room B&B, is just across the street from the People Mover station at the western corner of the Piazzale Roma. It's very popular with our readers, and especially with cruise passengers because it's so handy to the Marittima cruise basin. 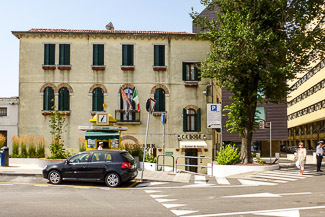 The Casanova FourRooms is a tiny B&B between Ca' Doge and the Hotel AC Venezia (see above), next to a walled parking lot where you can leave your car for a steep daily fee. Despite its unassuming appearance, the B&B is air-conditioned and equipped with modern conveniences (including private bathrooms). The location couldn't be handier if you're arriving by bus or taxi from the airport. The Casa Sant'Andrea is located in a 16th Century monastery just behind the Piazzale Roma and the People Mover, facing a quiet canal. 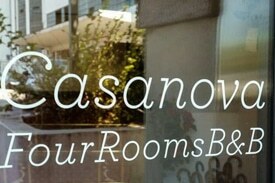 Rooms vary from singles to quads, with or without private bathrooms (depending on rate). Pets are welcome, Wi-Fi is free, the buffet breakfast includes gluten-free options, and--unusually for a B&B in Venice--the Casa Sant'Andrea has both an elevator and a 24-hour reception desk. 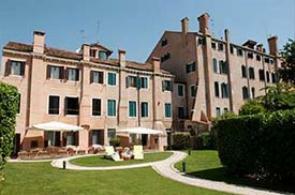 The Hotel Arlecchino is on the Fondamenta delle Burchielle, one small bridge away from the Piazzale Roma. Singles, doubles, triples, and quads are available, and guests have access to the garden of the Best Bestern Olimpia next door. 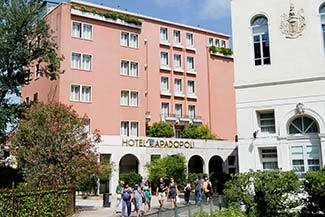 The Hotel Olimpia is an excellent hotel just beyond the Arlecchino, alongside a canal next to the Piazzale Roma. The hotel offers a variety of room types, including junior suites, and it has a private garden with beach umbrellas and deck chairs. Free Wi-Fi is available in all public areas. The Alloggi Marinella, a.k.a. 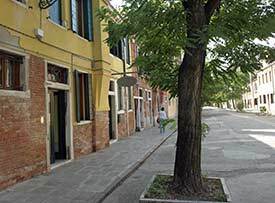 the Locanda Marinella, is one block beyond the Arlecchino and the Olimpia (see above), on a quiet pedestrian street lined with trees. The B&B has a courtyard where breakfast is served in good weather. A tiny B&B, Il Veliero Romantico, is just beyond the Alloggi Marinella (see above) on the Rio Terà dei Pensieri. It has three twin-rooms plus a shared dormitory with another three beds. 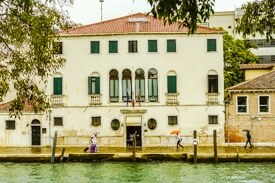 The Papadopoli Venezia is just beyond the public gardens that are reached via a low footbridge from the Piazzale Roma. It belongs to Sofitel's McGallery Collection of boutique hotels, and it's a good choice if you're looking for an upscale hotel with a bar, restaurant, concierge, and other services on the premises.